How to Play Spotify Music on Your Fitbit Versa? The Verse, Fitbit's latest wearable device, is a compact, lightweight smart watch and fitness tracker with nice looking and friendly design. One of the best features is the ability to download and listen to music on it without taking your phone nearby. 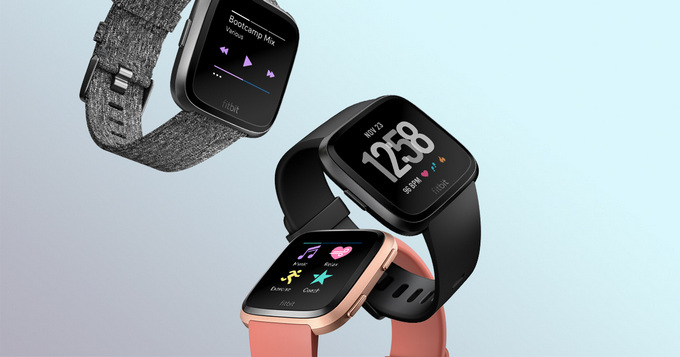 Deezer and Pandora are the streaming music services launched on Fitbit Versa, and you just need to activate the subscription to Premium and sync the streaming music to this wearable device. But many users complained that Fitbit Versa does not support Spotify, so this is very frustrating for these people who use Spotify as their default streaming music service. So how to download Spotify music to your Fitbit Versa? Firstly, you can add a vote for Spotify support, but before the partnership finally reached, you can use a third party software – Sidify Music Converter for Spotify to download your favorite Spotify music, playlist or podcast to MP3, then transfer and store Spotify music on the Versa. Now, let's look at how to download and transfer Spotify music, playlist or podcast to Fitbit Versa and listen to them on the whist without needing your phone. 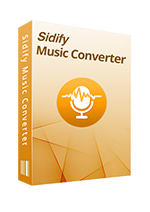 Run Sidify Music Converter for Spotify on computer after installation. Spotify app will be launched o the background automatically. Click on "+" icon at the upper left corner of Sidify main interface, and an adding window will pop up. You can drag & drop a song or playlist from Spotify to this adding window directly. Or you can copy and paste Spotify song or playlist link to the clipboard. 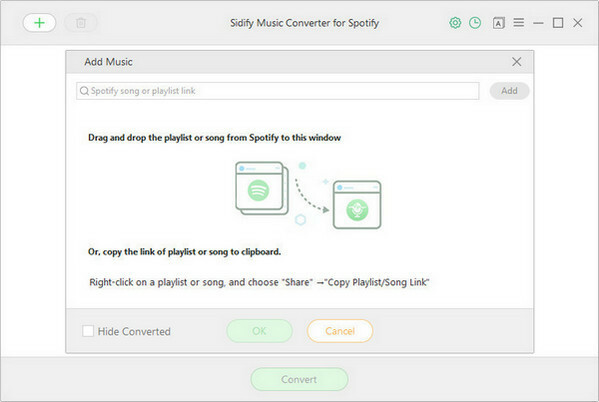 After Sidify Music Converter for Spotify successfully analyzing the song or playlist link, you can click "OK" to check the audio files you added. Tap on the Setting button at the upper right corner, and a smaller window will pop up to let you choose the output format (MP3, AAC, FLAC, WAV), conversion mode, output quality (320 kbps, 256 kbps, 128 kbps) and output path. Note: For better organizing your music library, you can save the output audio into organized folder like Artist, Album, Artist/Album, or Album/Artist. Otherwise, the output audio will be saved into one folder. 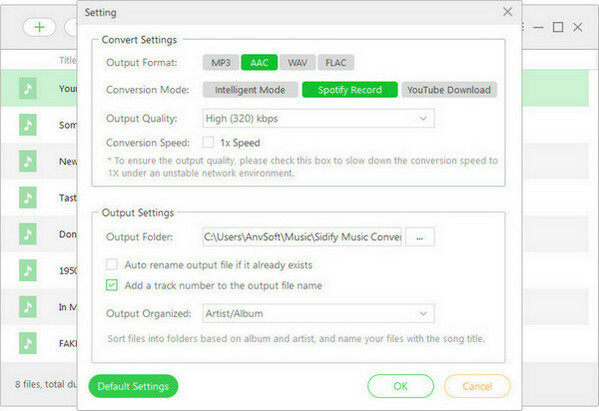 Click on "CONVERT" button to start downloading track, playlist from Spotify as MP3 or another output format you prefer. After the conversion completed, you can click icon to find the well downloaded Spotify music. 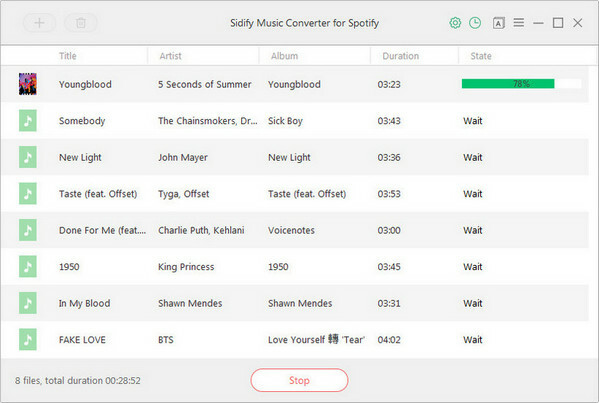 You have downloaded Spotify music as local files with Sidify Music Converter for Spotify, and now you just need to upload them to Fitbit Versa by following the steps below. Step 1: Click the Start button on your PC and open the Microsoft Store. Then search for "Fitbit app". After you find it, download and install it to your computer. Step 2: Open Fitbit app on your PC and log in your Fitbit account. And make sure that Versa and your PC are able to connect to the same Wi-Fi network. 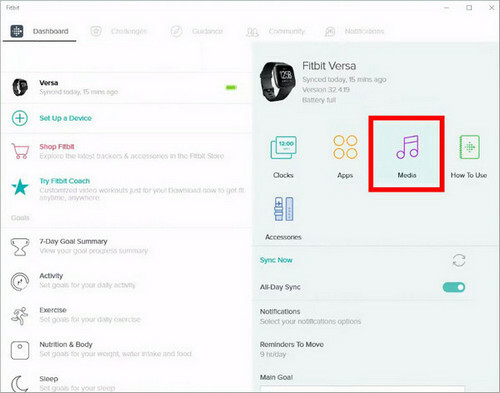 Step 3: On PC, open the Fitbit app and click the "Media" icon, then click "Personal Music" from the left panel. 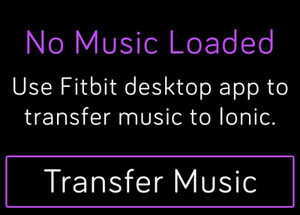 Step 4: On Versa, open the Music app and then tap "Transfer Music". Note that you may need to scroll down to see the transfer button. Then wait a few moments for Versa to connect. Step 5: Once your Verse connected to computer, a prompt will be shown to let you follow the on-screen instructions on your computer to choose the local music you want to upload to your watch. After you choose a playlist, the download will start automatically. After the download is completed, you can pair Bluetooth headphones or a speaker to Versa and open the Music app to listen to your Spotify music. You do not need to take your phone and computer nearby in order to listen to music from the Music app.